Graham Henshaw has been a runner most of his life. 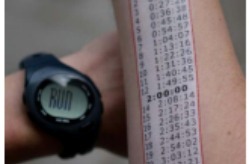 But the founder and CEO of Adhesion LLC had the idea for his newest product—PaceTat ™-- while he has watching a race. With product development complete, Henshaw decided to go to SCORE, a national not-forprofit association of successful business executives. From offices located all over the Chicago area, these multi-discipline business professionals provide free one-on-one counseling, teach low-cost business workshops and supply other resources to entrepreneurs and small businesses. Mitchell Morris became Henshaw’s lead counselor, and together they went to work analyzing his business and opportunities. They dug into the financials to look at sales trends, product pricing and profitability. They discussed existing and potential target markets and ways to reach them. Morris reviewed drafts of his business plan. Since much of Henshaw’s business was over the internet, Morris also brought in counselor Peg Corwin to analyze and make suggestions to improve his website and Google Adwords ads. Within 2 months PaceTat was the star of the Frederick (MD) Marathon Expo. Hundreds of people purchased the product at the expo and gave it rave reviews in surveys completed after the race. Then the Chicago Marathon and New Balance Shoes bought more than 10,000 PaceTats for distribution at the Chicago Marathon Expo. Since that success, many other races and sponsors have expressed interest in PaceTat, both as a runner’s tool and advertising medium. Adhesion LLC is now launching its second product, Life Drive ™, a tiny USB drive that clips to an athlete’s clothing and contains emergency contact and relevant medical information. The information can be accessed by EMT’s or doctors in the case of an accident. With continuing support from SCORE, Graham hopes to develop and market more innovative products for athletes in the future. Should you take up racing and need to keep a pace, you can purchase pacetat at pacetat.com. Should you need help developing and marketing your product, set up an appointment with a SCORE counselor at www.chicago.score.org.